The country-western gods smiled down upon the McCallum Theatre’s Muses last week, providing perfect weather and a magnificent sunset for their Denim to Diamonds outdoor dance and dinner picnic. The most frequently heard early evening phrase was “I never knew this place was here.” The venue was Regency Ranch — a rustic ranch that includes an Old Wild West town, with a jail, saloon, horses, barns and ancient trees at the end of an unpaved street — yet less than a mile from the intersection of Ginger Rogers Road and Bob Hope Drive. The ranch is owned by McCallum Trustee Peter Solomon, who donated its use to The Muses & Patroness Circle of the McCallum Theatre for this event. The dynamic ladies of the Muses are famous for going all-out with a theme, along with raising staggering sums for the McCallum’s educational programs which reach more than 40,000 local school children annually. Their all-out, country-western theme included amusing “Wanted Dead or Alive” posters featuring McCallum leaders such as Mitch Gershenfeld, June Benson, Helene Galen and Donna MacMillan, all of whom were arrested at a point in time during the evening and taken to jail. The food service, provided by Savoury’s Catering, was both outstanding and unique. Four different types of food service all took place at the same time: hors d’oeuvres were being passed, drinks were being served, a preset salad was (covered) on the table, and four identical food stations with grilled-to-order steaks and chicken breasts and sausage complemented by a great chili opened early. Given so many choices, there was no waiting anywhere, any- time, especially since so many of the guests would rather dance than eat. This was a great event! 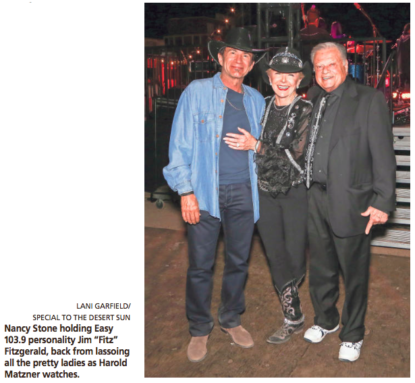 When Grand Marshal sponsor Harold Matzner arrived with Shellie Reade, co-chair Nancy Stone presented him with a twinkle-light necktie that was bright enough to compete with the searchlights sweeping the sky above, and he gamely wore it throughout the evening. Other major sponsors included: High Sheriffs Helene Galen and Nancy Stone; deputy sheriffs Marge Barry, Nancy Crandall, Sandra and Terry Hill, Peggy Jacobs and Bob Howard, Donna MacMillan, and Jan Salta. Bounty Hunters were Jack and Mary Lou Area, Barbara Freemont, Frank and Alvera Gaeta, Ted Giatas, JoAnn and Alan Horwitz, Cheryl McArthur and Mark Hogan, Monte and Ken Marts, Terri and Mike Neuman, Elise and Marty Pasetta, Linda and Manny Rider, Marion and Bob Rosenthal, Mary Silver/Louis and Mary Silver Foundation, Kim Smith, Barbara Waddell, and Linda and John Weaklen. The Posse donors were Carolyn Anderson, JoAnn Davis, Kay Hanson, Berndt Heidemann, Sami Lang, Donna and Douglas Martin, Frances Muir, Dawn Nordblom, Tommie Jean Pitts, Pauline Spivey, Sally St. John, Jean Viereck and Wendy Willson. McCallum president and CEO Mitch Gershenfeld spoke briefly, praising Matzner for his ongoing generosity to the theater and the community. Gershenfeld also enthusiastically promised that next season’s McCallum programming would be outstanding. He also recommended an evening with Melissa Manchester on April 9. The Kelly Rae Band received several standing ovations for their classic arrangements of nearly every country-western hit ever recorded, and emcee Jim “Fitz” Fitzgerald was applauded when he announced his new radio show on 103.9 FM. Peggy Berk pulled together a group of Muses to perform as top-notch, local line dancers who performed wonderfully after only four practice sessions. Event co chairs Marge Barry and Nancy Stone did not rest on their laurels. They continued checking on every detail and catering to every whim throughout the evening, assisted by Junior Muse Tricia Solomon Eppelheimer. They were also aided by Jeff Norman, Judi Cohen, June Benson and other tireless McCallum staff members. The Denim to Diamonds dress code, the vision of Nancy Stone, inspired the Muses’ own fashion plates to pile their diamonds up and let their hair down with some wild, wild western outfits, featuring fringe, studs, spurs, bling, bangles — and lots of moxie! She even arranged for a crystal chandelier over the T-Bar entrance to greet everyone as they arrived. It was glamor with a western vibe. For information on membership and future Muses events, contact Judi Cohen at (760) 776- 6186 or email at jcohen@mccallum- theatre.org .